When Limardo's check bounces, Kinsey discovers she's been had big time. Alvin Limardo is really John Daggett--an ex-con with a drinking problem, two wives to boot, and a slew of people who would like to see him dead. Now Kinsey is out four hundred dollars and in hot pursuit of Daggett. Wow… and I thought that ‘C’ had a dark tone to it. 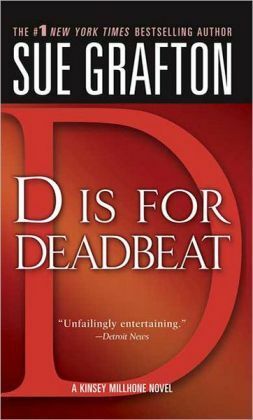 The ending of ‘D’ Is For Deadbeat is one of the most somber book endings that I have read in a long time. It made me an even bigger fan of Kinsey Millhone, though. I must say that. This book also took me back to not being able to guess the twist until it was revealed which was nice to encounter after I had guessed it earlier on in the previous book. I had hoped that wouldn’t continue, and Grafton delivered immediately with the next installment. I found this to be a really quick read even though it was a touch longer than the previous ones. Something about it just really gripped me and wouldn’t let go. This is a book that is going to stick with me for a long time.